Due to the winter storm that hit Atlantic Canada from February 10 to February 15, 2017, causing the cancellation of Canada Post mail delivery for over four days, the National Election Committee (NEC) of Unifor National Council 4000 has set back the election date for the Secretary Treasurer's position of Council 4000. The end of the election will now be on Thursday, March 23, 2017 (previously Friday, March 17) and all ballots received by this date will be counted by the NEC on Friday, March 24, 2017 beginning at 10:00 Eastern Daylight Time at the Council 4000 offices in Greenfield Park, Quebec (Montreal). The winning candidate will be announced once the votes have been properly tabulated. 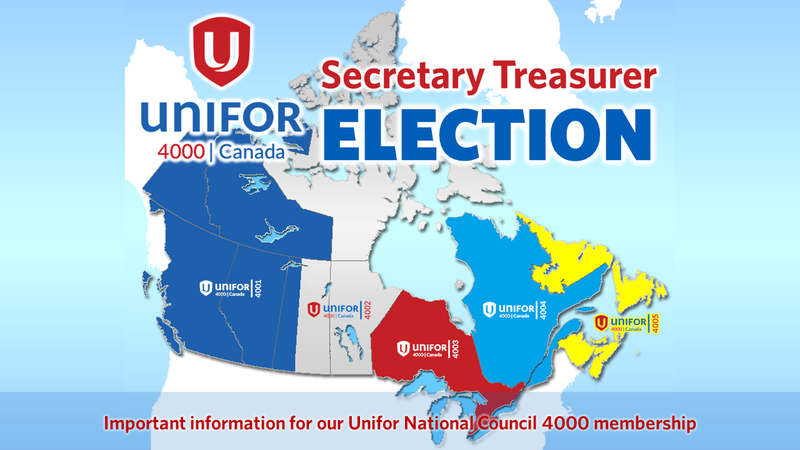 This is to advise that Unifor National Council 4000 – Locals 4001, 4002, 4003, 4004 and 4005 – will be conducting an election for the position of Secretary Treasurer for National Council 4000 for a new three-year term. As in accordance with the bylaws of National Council 4000, nominations for this position, along with the Council 4000 President, were conducted at the Council’s 6th Triennial Convention in Winnipeg, Manitoba November 25-26, 2016. President Barry Kennedy was re-elected President by acclamation. Please contact your respective member of the Council 4000 National Election Committee for these regions should you have any questions. Ballots will be mailed out through Canada post on the dates shown above.